Sarah Elizabeth (Bettie) was difficult to find for a couple of reasons. First, she is listed as Bettie frequently in the census, and second, she appears to have no children of her own. The key to finding Bettie was that she often kept other family members in her relatively empty house. 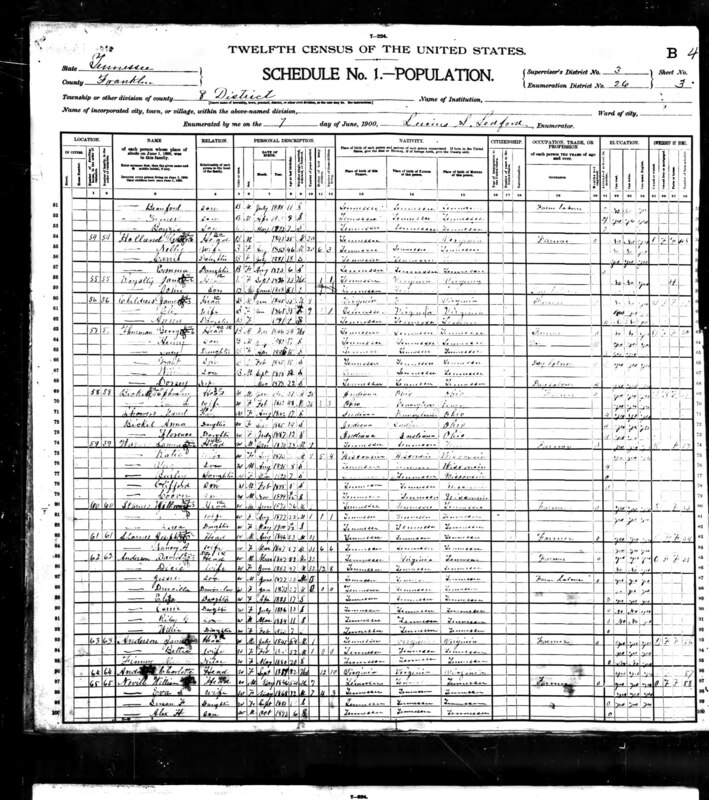 In 1910, her niece, Catherine Cash, daughter of Manley Wileman Cash (Mack) and Elizabeth Violet Arrick, is staying with her, and incorrectly transcribed as Rittie. Much of this information is derived from the census and much is left to be learned - and corrected. If you have information, please email me. 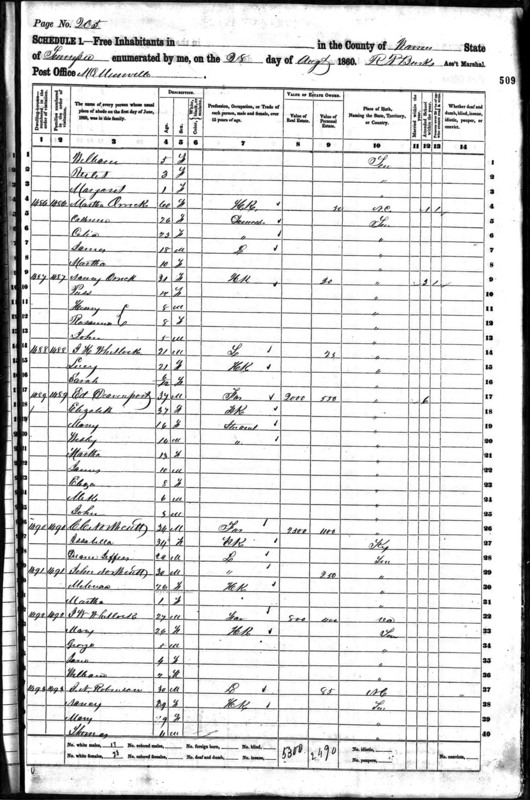 Married 1st: Rolly Crownover in 1881, Coffee Co.
Rolly was son of Charles Parker Crownover and Debra McBee. Apparently, Rolly died soon after their marriage and no kids were produced. Rolly's son T.C. Crownover from his first marriage signed as informant on Sarah Elizabeth's death certificate. Migration: Apparently Bettie Stayed in Middle TN all of her life. Were there any kids by Rolly Crownover? What happened to Rolly and where is he buried? What happened to adopted son Aubry Smith? 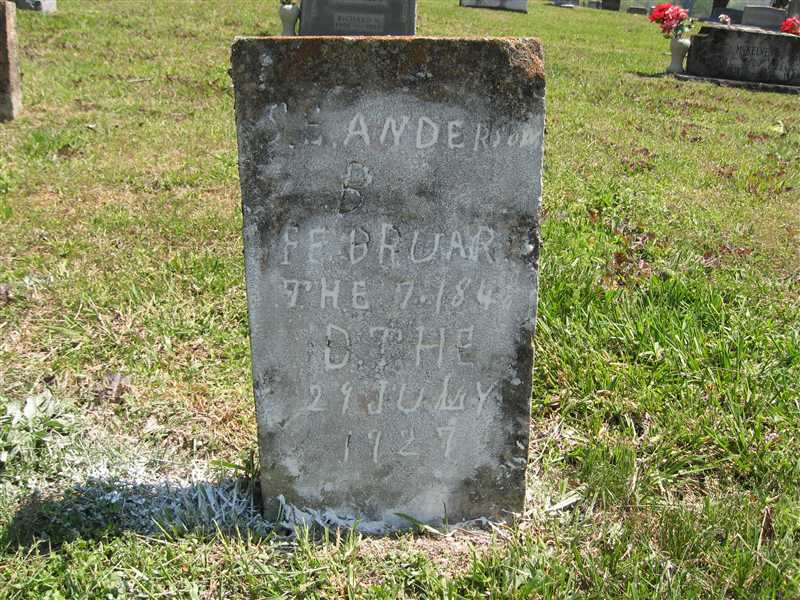 Who are the other Andersons at Payne's Church Cemetery? Parents were Lewis (b 1814) and Charlotte. Kids are Ben, George, Nancy, John Mary A, Eliza, Joel, Rebecca, Sarah, David, James B, James C.
Lived next door to Ben L Anderson and Betsey Ann. Lived next to Finney families. He died in Franklin Co, in 1925 at the age of 79, and is buried in Payne's Church Cemetery. 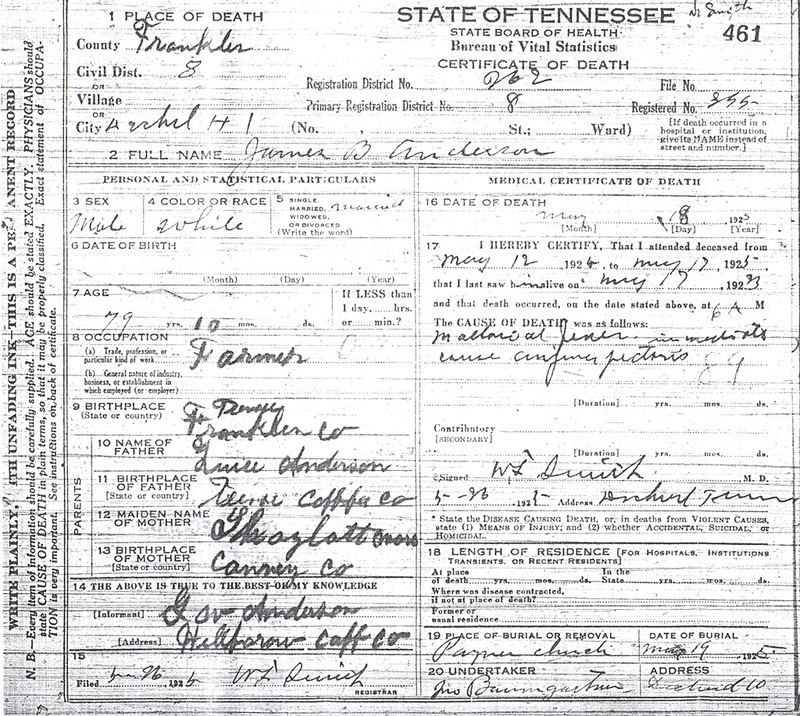 Death certificate for James B Anderson. Many Orricks pronounced their name "Ark" and it is spelled that way in many branches in several decades. Some of these Orricks eventually used the Arrick name formally. See this page about how some Orricks became Arricks. The 1870 census was difficult. 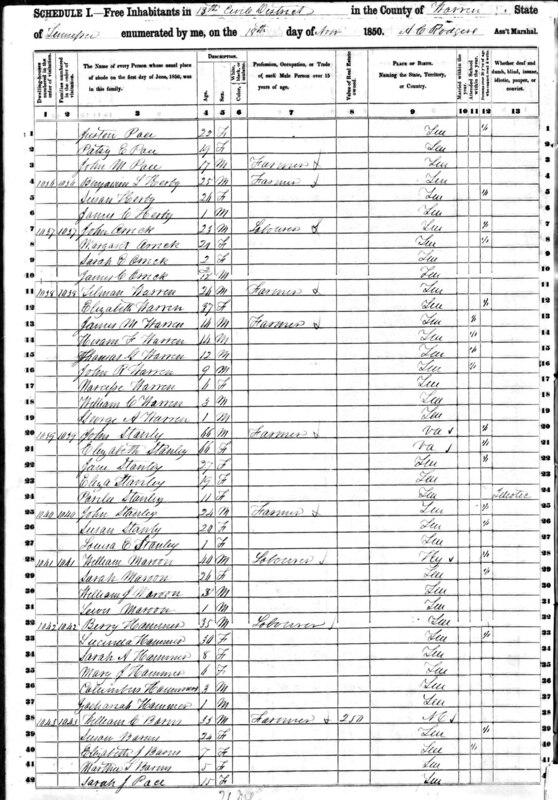 Many for Warren county census originals are undreadable. 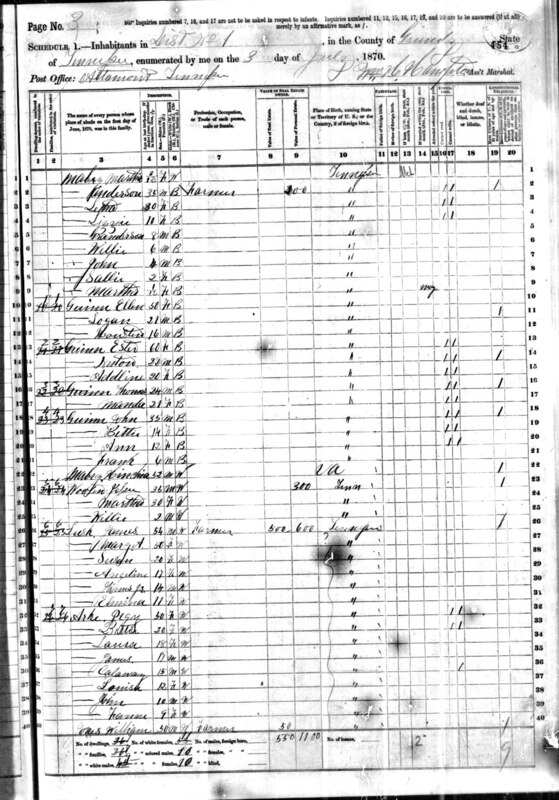 Here they are in Grundy Co TN Census page at the bottom. Grundy is right next to Warren. Arke, Calaway (male), 15 (1855) -- Is this William? Arke, Louise, (female), 12 (1858) -- Is this Elizabeth Violet? Arke, John, 10 (1860) -- Is this John Riley? Sarah Elizabeth is named Bettie, as she is in several future census. Here is the family in Coffee Co - Jno is passed. 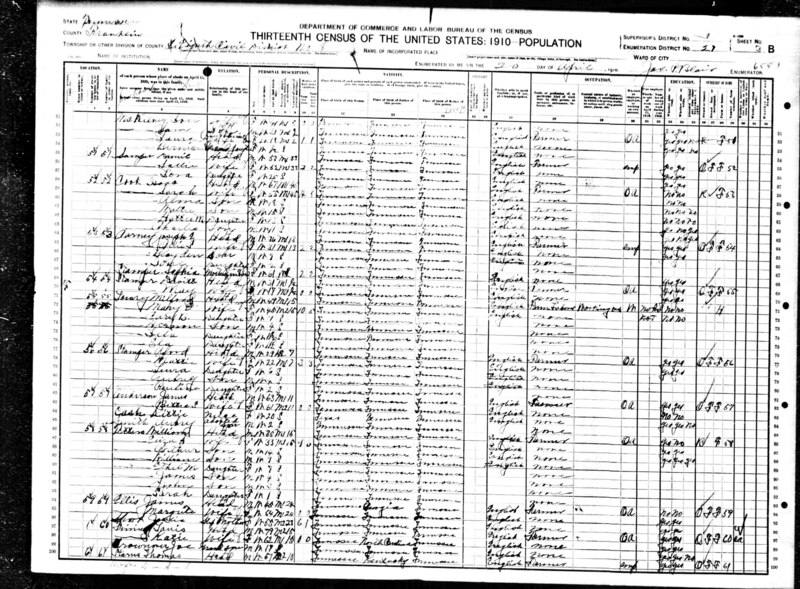 Virtually all of the 1890 census and special schedules were lost by fire, water, and human distruction. Sarah has married James Anderson - both in their 50's. They are living next to the large David Anderson family. And next door to Charolette, Widowed, James' 82 year old mother, born in VA, 12 kids, 10 living. Lewis, his father, is now passed. 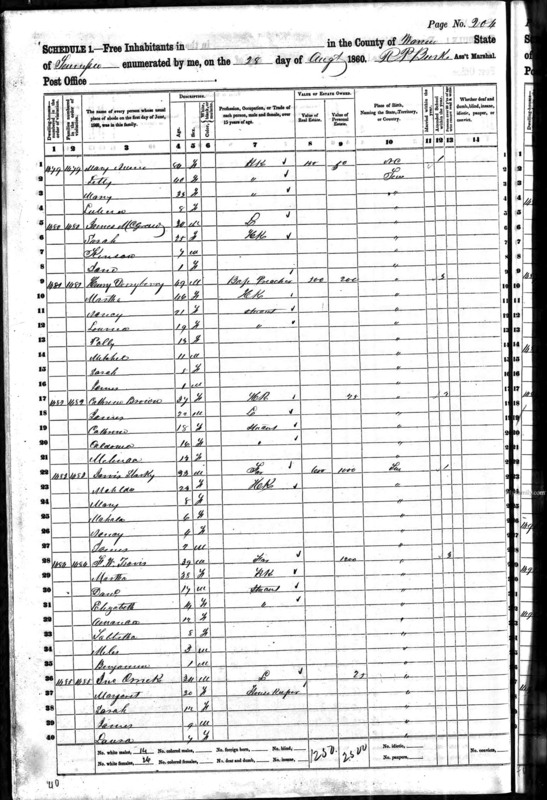 David is probably James' brother as shown in the 1860 Franklin Co census. Parents: Lewis and Charlotte. Other siblings Ben F, Nancy, Geo, Mary, Eliza, Joel, Sarah, etc. Sarah and James are keeping a Niece: Minnie Finney, born 1880. 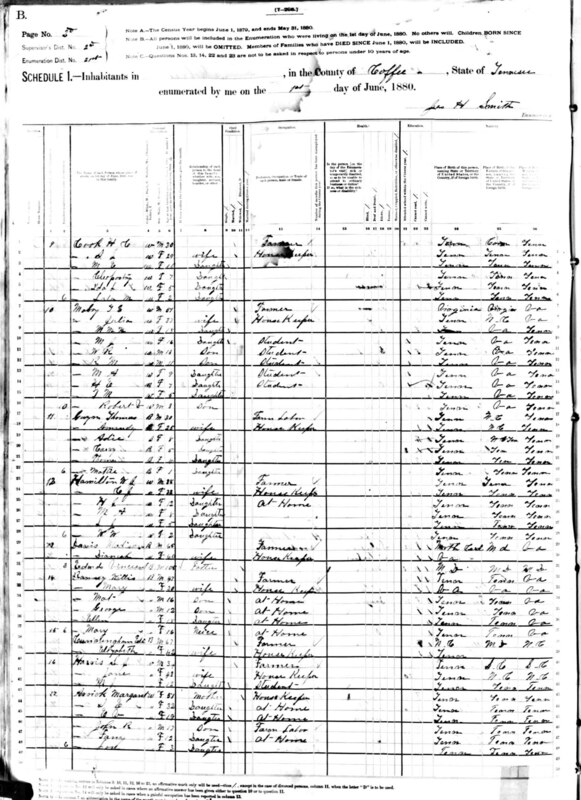 She is shown in the Franklin Co, TN 1880 census as the 1 month old daughter of James Finney (27), and Rebecca (22). Middle Initial D.
Later, in 1910, there is no Minnie Finney, but there are several Minnie D's in TN of the same age. Also in 1910, James Finney and his wife Martha of only 8 years is shown with several kids. It appears that Rebecca has passed and James remarried with a new family. There is a John (1853) and Sarah (1870) Finney family with many children on the same page. I'm unsure at this point who Minnie is or which side she is on. This is a complex story but there are many clues. Here is Sarah (Bettie) and James Anderson with their Niece Kittie Cash, 20 and adpoted son Aubry Smith, 2. I'm unable to locate Aubry in any other census. Kittie Cash is Catherine Cash, daughter of Manley Wileman Cash (Mack) and Elizabeth Violet Arrick. She has moved from Texas where she was born back to TN along with her Dad. Later she marries a Pearson and lives with her Dad in Coffee Co.
Kittie (Catherine) Cash is the son of Bettie's sister Elizabeth Violet Arrick (Eliza) and Manley Wileman Cash (Mack). 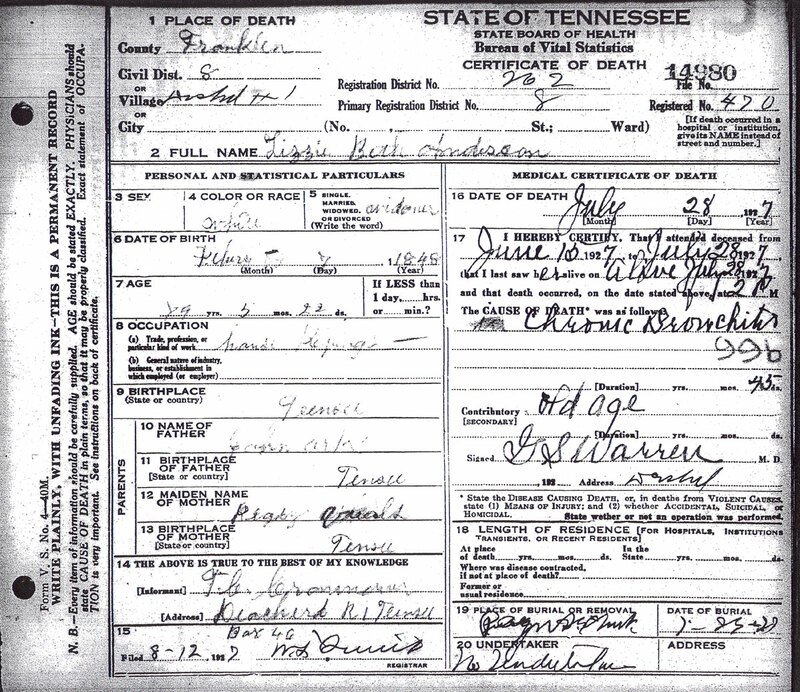 Kittie was born in Cleburne TX, Eliza passed just before 1900, and the family returned to TN. Aubry is not found in any future census. It's unclear what happened to him. Here's the family in the Franklin Co again, this time with a Niece Lizzie B Gillium, and a hired man Franklin Gunn/Bynum?. The Henry Finney family is nearby. In 1910, there is a Sam Gilliam (1880) and Maggie Gilliam (1884) family in Franklin Co with several kids including an Elizabeth, 2, which matches. 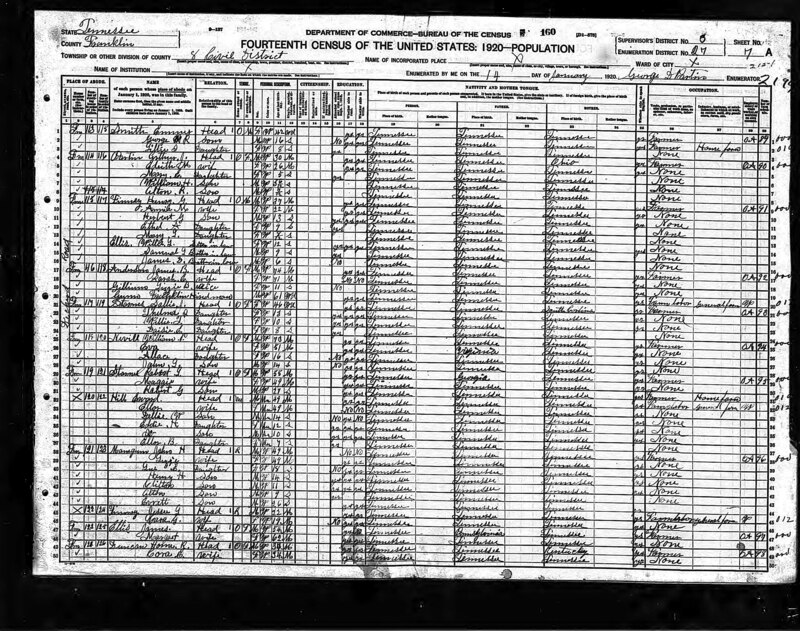 But this probably isn't her because the family is also in the 1920 census - unless she was counted twice. Sams wife is Margarett M (1883) which doesn't match any other sisters if S.E. So, I don't know who she is. Possibly she is a daughter of a sister of James who married a Gillium. Special thanks to Marsha Frank who pointed us to the Payne's Church Cemetery records. #86. J. B. Anderson    This must be James B. Anderson, Sarah (Betty's) husband. Born: March 11, 1891    Unknown, Only 17 years old. Born: May 30, 1848           These dates don't match the death cert or the cenus, but close.